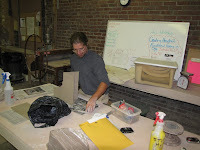 I was at Clayworks on Tuesday night working on some new forms. I threw a couple of low phoenix casseroles but I'm not sure if I like them enough to keep them. I also threw a closed form in craggy crunch that I flattened to make more of a "canvas" for decoration. 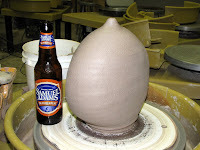 I've been thinking about a flattened bottle form for a week or so to create that canvas. Becky had talked to me about a possible collaborative project for her cave art. She said she wanted to try some larger areas to decorate and I immediately thought of this shape. I hope it works for her but I will be glad to try another shape if she needs it. Nick was there and we enjoyed our conversation while working on our respective projects. 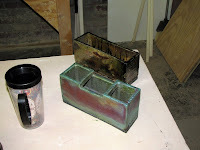 Being a botanist, Nick thinks about plants a lot and makes some great planters for them. It was a good evening, but I stayed WAY too late. Go figure. More of a side view. 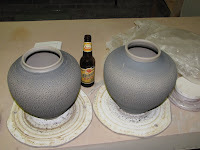 Nick's planters that we raku fired on Sunday. 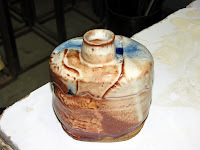 I went to Clayworks on Sunday to help out with the barrel/saggar/raku firings and finished off three possible lids for one of my crackle pots. Becky and Elaine loaded the barrel and started that firing before I arrived. By the time I got there it was smoking nicely and the pieces inside were at the mercy of laws of physics. 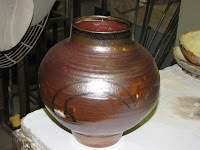 We did saggar firing in the raku kiln. 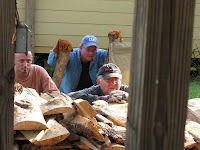 We brought it up to ~1150 F like Andy Smith taught us at his workshop and the results were tremendous. Becky was thrilled with her birds and I think Nick nailed it when he called them "stunning". 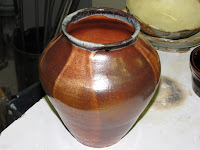 Next up was the raku firing. 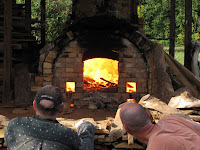 We brought the kiln up to ~1750 F while we watched the glazes get juicy and then lay down. 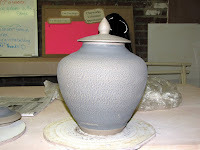 Becky and Nick were happy with their pieces but unfortunately all but one of Amy's slab pieces cracked. 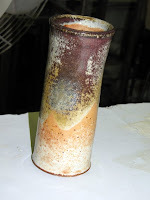 I think the earthen red she used could be part of the problem since it has no grog, and couldn't survive the thermal shock, but I will check with Greg Scott on that theory. Becky also did some horse hair work on some of her birds and Cindy's cats. 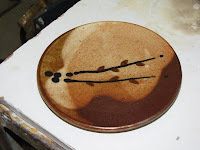 They came out nice, but we should have let them cool a bit more before removing them from the kiln. 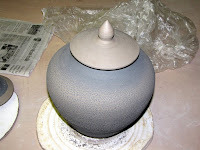 In between the firings I worked on my lids for one of my crackle pots. I ended up making three very different lids to compare. I like all three of them for different reasons so I don't know which one I will pick. 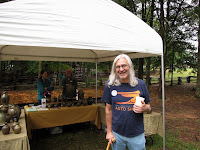 Saturday Minke, Melissa, Joe and I went to the Piedmont Pottery Festival in McConnells, SC in Historic Brattonsville. 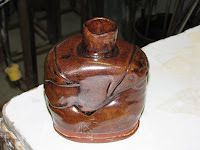 There were many traditional potters in attendance with a big emphasis on face jugs. 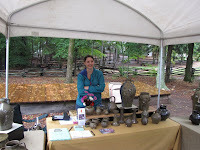 It was a drizzly, soggy day, but it didn't seem to affect anyone's mood as everyone was in good spirits and buying and selling pottery. I checked in with Adrienne Dellinger, Corine Guseman and Hal Dedmond. I stopped by to talk to Chad Smith whom I met at Hal's recent firing. 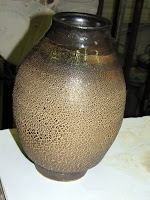 I finally got to meet Michel Bayne and see his pottery in person. I talked to Michael Ball whom I met at the Mint Museum sale and I regret not getting around to check in with Brad Lail whom I also met at the Mint. A wonderful surprise was meeting up with Peter Lenzo in front of Adrienne's booth. We had a nice conversation and I was pleased to find out that he hasn't stopped at 100 pots, but that he is currently on pot 103. In his words, "Well, I finished 100 and I was still alive so I thought I'd keep going." He currently has a show in Detroit where he once attended school and the pieces were selling well. He also told me that the piece he created at our workshop last year came out great and that he sold it for a good price. I would have loved to have seen the finished piece and I'm glad it sold. He swelled with pride when he told me that (his son) Joe has developed quite the touch with clay and is making some impressive face jugs. Joe is not self-conscious of leaving features at the gesture stage where most of us would have to tweak it to make it more "finished". I understood completely: sometimes a gesture is enough. Something I still need to learn. 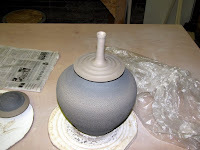 I also told Mr. Lenzo that Greg Scott and I have adopted his name as a verb when adding pieces to a pot as in "Lenzoing". "I'm going to Lenzo this thing onto my pot." He really got a charge out of that. I'm glad he liked it. It meant a lot. I made two purchases that I will upload later (too tired tonight). After slogging around in the mud and making our connections and purchases we decided it was time for lunch. We stopped at Groucho's Deli and picked up sandwiches before heading back to Joe and Melissa's for lunch and some of Joe's gourmet microbrewery beers. 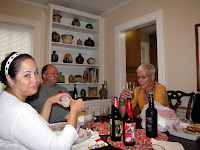 The food was good, the beer was delicious and the company and conversation was phenomenal. 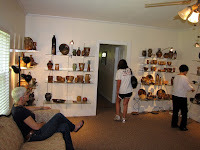 We also got a tour of their pottery collection, their comfortable home, the pottery shed, and gardens. Thanks Melissa and Joe for a great day! 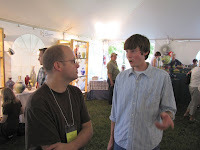 Joe talking to Michel Bayne. Mr. Peter Lenzo on the move. 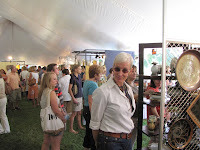 look on from Adrienne's booth. 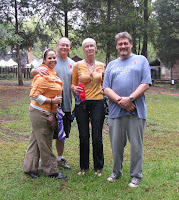 Melissa, Joe, Minke, and yours truly. 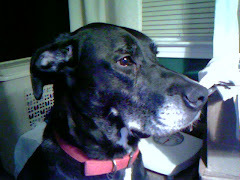 Minke sitting at the coolest table at Joe and Melissa's. slides out and you add five leaves. Joe discussing pottery and pictures with Minke. 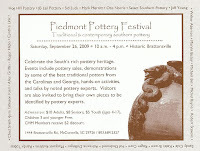 The Piedmont Pottery Festival is taking place in McConnells, SC. 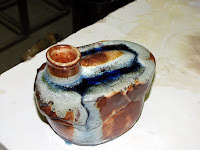 Greg's wife, Adrienne Dellinger will be one of the potters featured there. 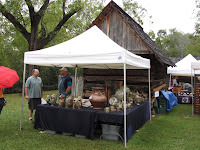 Ron Philbeck is having his Fall Sale Saturday and Sunday in Shelby, NC. You can check his upcoming events here and be sure to check out his blog here. Festival in the Park is happening at Freedom Park in Charlotte, NC. 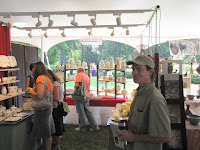 My pottery teacher, Greg Scott is going to be there as an Emerging Artist and will be doing demos. 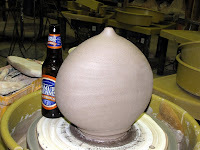 Wednesday night class at Clayworks. 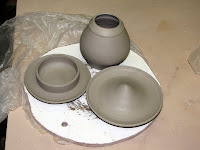 I made some lids for the pots I made on Saturday (and forgot to photograph). 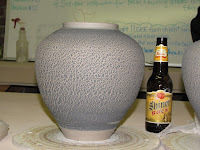 I made some more crackle finished pots out of phoenix on Saturday. One has blue slip and one has black. These should be interesting since the clay will fire mostly gray. 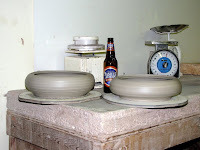 I'm trying to get more volume in my pots. I want them to command some space and don't just live in someone else's. Step by step I'm getting more comfortable in my clay skin. 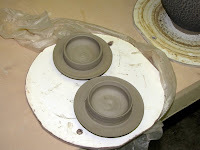 Alternate lids and a small pot. 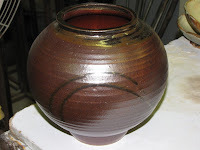 My earthen red pot was fired. 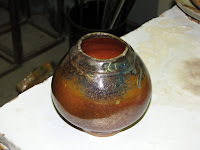 I went to the studio to glaze some earthen red pieces I made. One was thrown and then altered, and the rest were (are you sitting down?) ...hand built! I don't do much hand building, but I really had fun with these pieces. I made them in between classes when I didn't have access to a wheel. I was just playing around with these, but I think I will try some serious work soon. 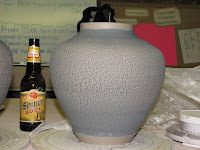 We unloaded the big gas kiln tonight. 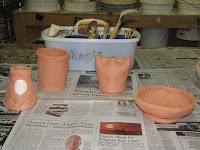 I was pleased with most of my pieces and can't wait to tweak my glazes by what I learned tonight. A couple of my bottles had marbles on them and the glass ran more than I had planned. I will be grinding a shelf in the near future --something I've never had to do before now. Another learning experience. 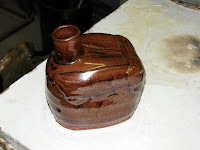 Remember the "crackled pot" w/black slip? 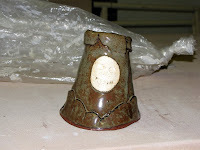 Remember the "crackled pot" w/chrome green slip? Got another box of veggies from Absolute Organics today! If you sign up with Absolute Organics, tell 'em I sent ya'. 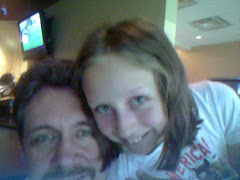 Minke and I started out meeting at the Yiasou 2009 Greek Festival at 11:00 am for lunch before heading to Clayworks. Unfortunately the festival doesn't open now until 12:00 pm so we went to Dunkin' Donuts for a cup of coffee before heading back to the festival. At 11:45 am the waiting line was all the way around the corner of the block, so we gave up and went to the studio. I glazed some pieces and completely forgot to take any pictures of them because I apparently checked my brain at the door. More about that later. 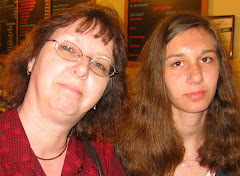 I caught up with Becky and Ann and forgot to take some more pictures. 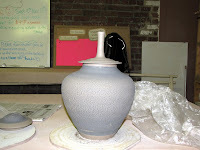 Julie and Greg were loading the gas kiln at 7:00 pm and I was going to head home for dinner and then come back and help. Soon it was 6:30 pm and I hadn't left yet, so I stayed to help load. The loading took a while, but we got most of the students' work in before closing the door and lighting it. We left it in Julie's more than capable hands. 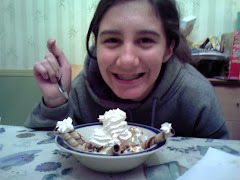 Now it was 9:15 pm and on the way home I realized that I hadn't eaten anything since my small breakfast. Remember what I said about checking my brain at the door? No food for almost eleven hours --and I never even thought about it. Duh. You'd think at my age I would know better. 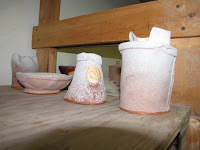 Anyway, I am anxiously awaiting Wednesday night's kiln opening. 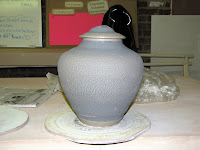 Saturday flew by in a flurry of great pottery. I ran into several people that I know and was introduced to a few whose reputations preceded them. It was really fun to catch up with friends and share some of the wonders around us. I am already looking forward to next year's sale. 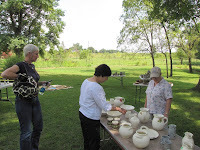 As planned, Minke and I met up with Ju-Ian at the sale and headed for Dedmond Pottery in Lawndale for the clearance sale and kiln firing. 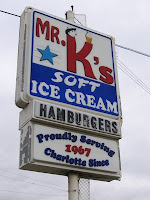 Before hitting the road we needed to get some lunch and I found out that neither of them had ever been to Mr. K's on South Blvd. We went there and had the Big K with fries. I'm glad I could initiate them to one of the simple joys of Charlotte. 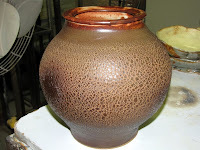 After our repast we were back on our way to Lawndale and Dedmond Pottery for the clearance sale and kiln firing. It was a beautiful day and drive and we had some good tunes on the stereo and some great conversation. 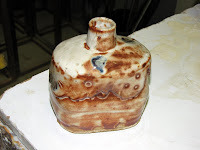 Corine and Hal had quite a bit of great pottery marked down for clearance and I couldn't leave two pieces there. We also went into the gallery and I picked up a mug I had to have. 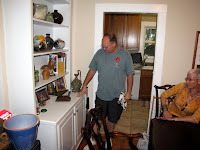 The gallery is actually Hal's grandparents' house and is a great place to show their work. 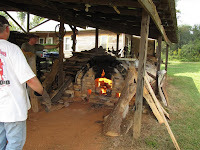 Once I had purchased more than I had planned, we headed up the driveway to check out the kiln firing. 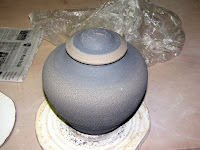 I felt bad since I had volunteered a few months ago to help with the firing, but then I never followed up with it (Me? Go figure). I felt better when I saw Hal had plenty of help for this one, but I do want to help with a future firing. They were at it since 7:00 am and we arrived at 1:30 pm when the temperature was about 1970. They were going to 2300 and it had plateaued for a while, but it picked up again and they were well on their way when we left. 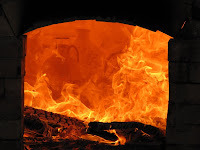 I was reminded again what hot work stoking a wood kiln is. 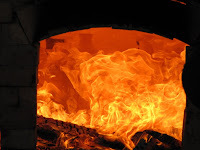 If the temperature inside the kiln is 2000 degrees it's probably 1800-1900 degrees at the fire door. I still want to do it. 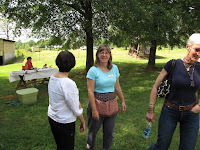 Corine showed us the studio, mixing shed, kiln shed, and her new classroom. She is going to hold hand-building classes and already has a waiting list. I wish her the best with it and know she will excel at it. All too soon it was time to head home again. Corine and Hal truly do have a magical place out in the country and I love to visit them. I want to thank them again for having us out. Ron Philbeck and Brad Lail. Greg Scott at the Mint. Ju-Ian, Corine, and Minke at Dedmond Pottery. Bargain hunters on the prowl. 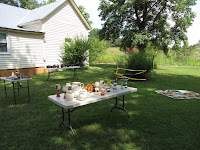 Lots of great pots for sale in a peaceful setting. The gallery in the house. Hal keeping a watchful eye on the kiln. Praying at the fiery altar. Actually, everyone was trying to see the back cone packs. Here's what they were looking at. 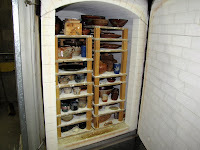 to the very back of the kiln. The flames change the view by the second. The butterflies didn't seem to mind the smoke.